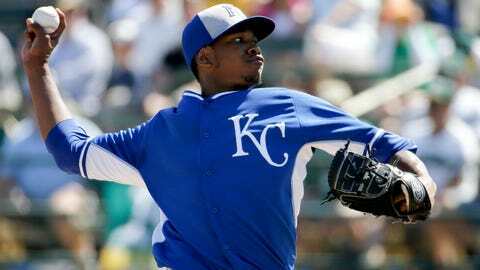 Yordano Ventura will be a big attraction at The K this summer. KANSAS CITY, Mo. — Unlike so many past spring trainings, the Royals simply didn’t have many issues to resolve this time around. The Royals entered the Cactus League schedule with precious few roster spots open, and with no real competition for front-line jobs other than the fifth spot in the rotation. That, of course, is a good sign, telling us that the Royals already have made the upgrades they believe are necessary to propel them to the playoffs. Even before the Royals started spring training, club officials were extremely confident that Yordano Ventura would win the battle for the fifth spot in the rotation. Though in theory the competition encompassed Ventura, Danny Duffy, Luke Hochevar, Wade Davis and a few others, the Royals believed that Ventura would blow away everyone else. And Ventura did. He topped the 100-mph mark during a recent FOX Sports Kansas City telecast and got all of Kansas City buzzing. 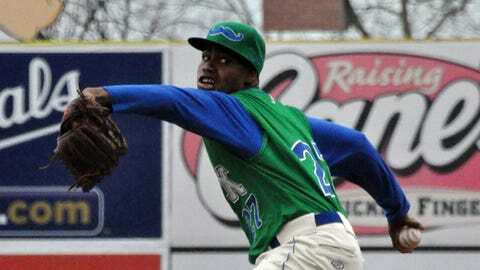 He certainly will be an attraction at The K this summer. Club officials also were fairly certain that left-hander Duffy really needed to continue to work on his command at Triple A — most figured he would wind up at Omaha unless he had a wildly fantastic camp, which he didn’t. Duffy remains a significant part of the Royals’ plans, and if he can control his emotions and establish better fastball command, he could be back with the Royals by June or July, possibly to take Bruce Chen’s spot in the rotation. Chen then would go to the bullpen. The Duffy-to-the-pen experiment was short-lived. "Danny’s value to us is as a starter," general manager Dayton Moore said often during the spring. The common perception after Hochevar was diagnosed as needing Tommy John surgery was that the Royals’ deep bullpen could absorb the loss. Bullpen success can be finicky, if not at least streaky, and having as many quality arms in the ‘pen as possible is essential. That became evident last season when the Royals’ trio of Aaron Crow-Kelvin Herrera-Tim Collins simply couldn’t be counted on down the stretch. Hochevar came to the rescue and essentially became the main setup man to closer Greg Holland during the final five weeks. Now the Royals will rely heavily on Davis to provide that setup role. But if he falters …. Mike Moustakas hitting a home run in Arizona. Or a double. Or a two-run single. Or triple. Or, well, you get the idea. No one has tortured Cactus League pitchers in the last two springs more than our man, Moose. If the Royals suddenly relocated from Kansas City to Surprise, Moose probably would win a Triple Crown. Once again, Royals fans are hoping that Moustakas can translate that spring success to when it counts in the regular season. The key? If Moose truly is going to hit to all fields, as he says he will, he has a chance. Omar Infante continues to battle his elbow issue, and there’s still no guarantee he will be in the starting lineup Monday. But it is amazing how just one player can make the Royals’ lineup look so different. With Infante penciled in, the Royals’ lineup looks legitimate, one through nine. Without Infante, the Royals are looking at Pedro Ciriaco or Jason Donald or Danny Valencia, and that agonizing black hole at second base again reappears. The Royals continue to cross their fingers that the bone spur in Infante’s elbow will quiet down and that surgery isn’t needed. Losing Infante would be a big early-season loss.